Rolls-Royce has lifted the covers off a new limited edition version of its Phantom Saloon, at the Paris Motor Show this week. Named 'Metropolitan Edition', the new model has been built to "pay homage to the world's great metropolises," according to the iconic luxury marque. Just 20 examples are to be made, each based on the current Phantom Saloon. Distinguishing the Metropolitan Collection from other Phantoms is its cityscape theme, which is most notable in the incredible detailed marquetry on interior wooden trim pieces. For those not familiar with 16th century craftwork, marquetry is the art form of laying small pieces of wood veneer to create decorative images. These are applied liberally throughout the Phantom's cabin, featuring not only on the slab of wood dashboard trim, but also on the rear picnic tables. Further highlighting the urban theme is the car's unique 'Aetherius Grey' leather, which Rolls-Royce claims to echo the colour palette of modern cities, alongside the 'Darkest Tungsten' exterior finish. The dashboard clock also features additional markings for global time zones. 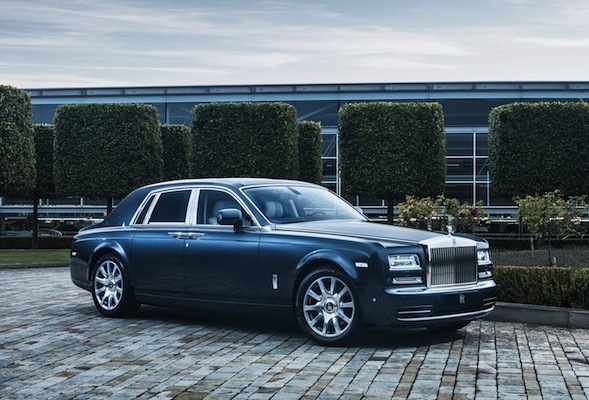 Speaking on the car's unveiling, Torsten Müller-Ötvös, chief executive officer of Rolls-Royce Motor Cars, said: "I can think of no more fitting location than Paris to debut this remarkable new motor car. This is a city that echoes Rolls-Royce's very special brand promise in perfectly combining the timeless and modern in a manner that celebrates the art of the master craftsperson. "Our customers across the globe delight in challenging our designers and craftspeople to create true, one-of-a-kind pieces of automotive art. This latest Collection serves to showcase the extraordinary scope for bespoke personalisation afforded to every patron of the marque." This isn't the first time Rolls-Royce has created a special edition. Earlier this year it released the Waterspeed Collection, a vivid blue creation based on the Phantom Drophead Coupe, built to commemorate Sir Malcolm Campbell's 1937 water speed record.